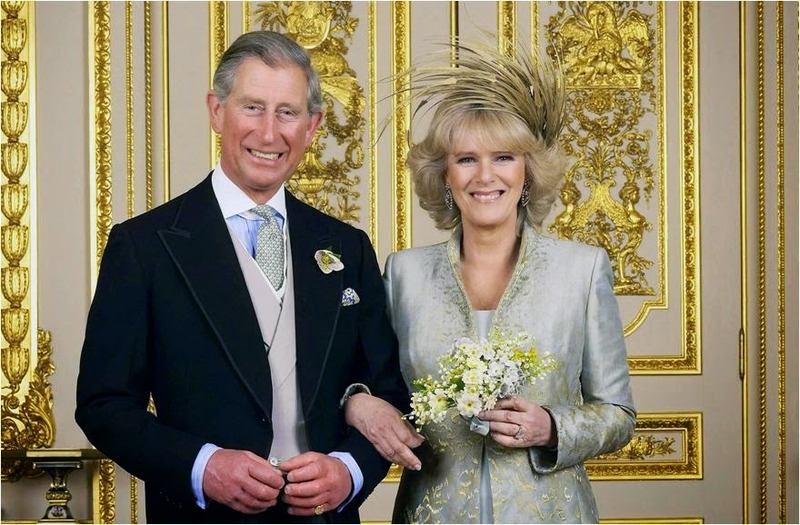 In honor of their 10th wedding anniversary, we're looking at the guests at Charles and Camilla's wedding on the other blog (and we've looked at Camilla's wedding ensembles there in the past), but a jewel flashback is in order over here. We've been focusing on some of the main pieces from the couple's engagement and wedding since we added Camilla's jewels to the blog, and now we'll round them up as they were worn on that big day. And we won't forget about The Queen, either! The long-awaited day finally came on April 9, 2005 - just one day later than planned, after things were postponed so that Prince Charles could attend the funeral of Pope John Paul II in Rome. For their civil ceremony at the Windsor Guildhall in front of a close family group, Camilla donned an oyster Robinson Valentine dress and coat with a Philip Treacy hat. She pinned on her petite Pearl and Diamond Prince of Wales Feather Brooch, a perfect choice as it was both her husband's symbol and also a gift from him that she had been wearing for some time. To this, she added her Everyday Pearl Pendant Earrings. After a change of dress (a Robinson Valentine coat dress for the bride), it was off to St. George's Chapel at Windsor Castle for the larger blessing ceremony. Her Diamond Flower Pendant Earrings added a small touch of luxury without going over the top for a daytime affair, and the rest of the accessorizing was accomplished by her golden Philip Treacy headpiece. Of course, her heirloom diamond engagement ring and new gold wedding band were in place throughout the day. Also in attendance at the blessing ceremony: Her Majesty, looking resplendent in a yellow and cream outfit that was a perfect showcase for the yellow and white diamonds of the Australian Wattle Brooch. The Queen does have a tendency to increase her diamond wattage for big royal weddings, and this was no exception. It's a testament to how much she enjoys her Australian gift, that she would wear it to such a prominent occasion, and I do love that she wore what is perhaps her most noted Commonwealth gift to the wedding of the future king. A gorgeous choice for a happy day, wouldn't you say?